Vicky Joseph, business alumna, starts Families Helping Families in Illinois. Brig Owens has reached more than 24,000 students in Washington, D.C.
Brad Wenstrup supports a military hospital in Iraq. Emily Nelson, theater alum, helps those at Cincinnati Shriners Hospital for Children. Mike Ullman's Mercy Ships travel the globe. Deforia Lane, a music therapist, uses the power of song to ease the mind. Stanton Glantz works for clean air. 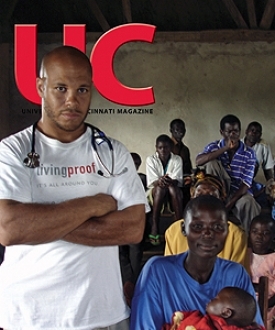 Christopher Lewis is founder and president of the nonprofit Village Life Outreach Project. Mike Reynolds creates off-the-grid houses made from garbage. Dorothy Smith founded a company that helps patients manage their prescriptions. Alexander Goode was one of four remarkable men who went down with the Dorchester during World War II.